Take your first step towards a new career. Cosmetology is a growing industry, and the programs at the Daphne campus prepare students in less than a year to enter new careers in these fields. For many, these careers are rewarding improvements over their current jobs, offering higher wages/salaries, more benefits, better workloads or the creative freedom to work for themselves as independent contractors. 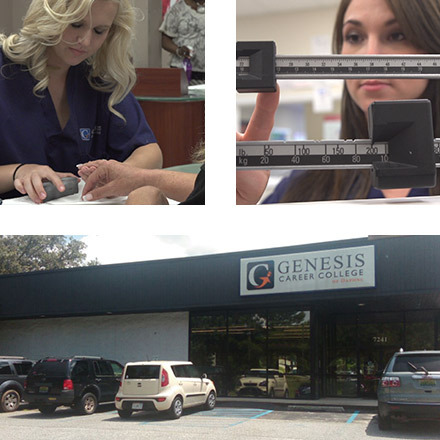 To learn more about Genesis, the cosmetology program of your choice, or to make an appointment for a campus tour, click the button below to fill out our contact form and an advisor will be in touch. Our Cosmetology Program incorporates 1500 hours of comprehensive hands-on learning to provide a complete understanding of shampooing, permanent waving, hair cutting, color and texture, fashion trends, makeup and state licensing preparation.